On the bright side, one good thing is that it will force me to prepare meals that are Violet-friendly rather than giving her something different from what we are eating. Another plus is that I already have a lot of dairy-free food substitutes in my repertoire and am an expert label reader as a result of her condition. So I think I'm going to survive (other than the cheese thing). And if anyone knows of any good dairy-free or vegan blogs I'd love to add them to my blog roll. Thanks in advance and wish me luck! Oh, I forgot - just some food for thought: A cow has 4 stomachs and is basically busy ruminating their food all day which humans don't. So it's very logical to me that there indeed are humans, like your sweet Violet, out there who can't tolerate dairy. Are you allowed to have goat cheese?? It isn't dairy per se and I find it to be just as yummy when I'm avoiding cheese due to a bout of migraines. Just a thought....I will even put it on noodles and make "goat cheese mac and cheese." I swear it is still delish! Goat cheese still contains lactose, although not as much. I've heard that some people who are lactose intolerant can eat it with no problems. I may try it if the dairy thing works out for me and see how it goes! Hi Lauren! I had to avoid most dairy for a few years (could still eat cheese, though, thank goodness!) but really, really, really missed ice cream. 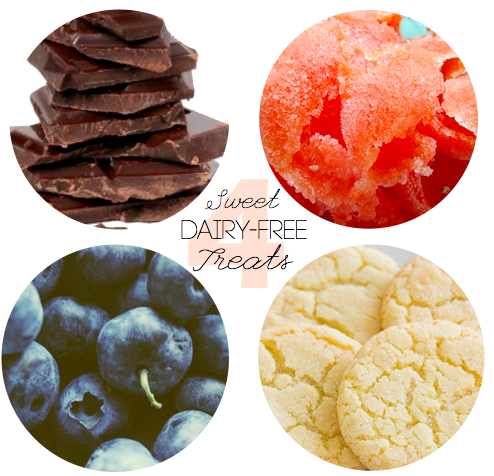 Luckily, there are some pretty good dairy free ice cream substitutes (Trader Joe's has some good ones!). I like Oh She Glows (http://ohsheglows.com/) for vegan recipes, she has a lot of tasty-looking sweets and treats, too. Thanks for the website - I'll definitely be checking it out! Daiya Cheese is great (not a soy product and it melts)- i make pizzas with the mozzerella one and the coconut milk ice cream,so delicous is the brand I think, is awesome! I have been dairy free for almost 7 months because my almost 1 year old has a dairy allergy/intolerance and I'm nursing. It is HARD at first but then you adjust and like you said you already know a lot about substitutes! I sub rice milk for milk and Earth Balance for butter or I just use olive oil....yeah, things aren't as creamy but not too bad. PPK is AWESOME!! Post Punk Kitchen that is. Also try the Kind Diet book - lots of yummy (vegan) snacks (Plum Oatmeal cookies are in the oven as we speak!) and really good healthy recipes. I went Vegan before I became pregnant with my daughter (I swear that's how we got pregnant - I was SUPER healthy at that time!) and I am trying to head back in that direction. The Kind Diet talks a lot about what dairy-free products are out there and you can decide how dedicated you want to be. I just use the recipes but the information she writes about is really interesting. That book really helped me transition off of cheese (sigh) though I never had much other dairy in my diet to begin with - ick tummy issues - but when I was pregnant? Sheesh I could eat mac and cheese and have clear skin and no issues. Anyway there are lots of great vegetarian/vegan recipes out there but you can definitely add meat to them - just no dairy! Thanks for the recommendations! I really want to make sure I have a lot of variety so that I still get all of the nutrients and things I need. Oh goodness I dont think I could give up cheese. Or ice cream. But dark chocolate and fresh fruit are good alternatives for dessert. Good luck! I had to give up dairy, wheat and corn when I was breastfeeding my little guy because we couldn't figure out what was wrong with him and I have to say I'm with you on the cheese - there is NO good alternative to cheese (I'm not a soy fan and Daiya cheese tastes like cheese slices and has no nutritional value...). I eat goat cheese (there is cheddar and mozzarella too!) now because some people who can't tolerate cow dairy can tolerate goat but it still is hit or miss really. Also one more thing I just learned - apparently almonds are very high on the list of pesticide usage so try if you can, to opt for organic (with milks etc.). I had to go dairy free for six months with my baby. It wasn't so bad as long as we were eating at home. Eating out is a whole different animal. Did you know oreos are dairy free? Also coconut ice cream is suprisingly delicious. I've also heard of a coconut milk based greek yogurt, but never tried it. Also, Fleishcman's stick margerine is dairy free and you can bake with it (a lot of margarines still have some dairy in them, but this one does not). After having gone dairy free while nursing , I've had to go back to being (mostly) dairy free. I discovered I can have goat cheese (which was a huge relief). Possible suggestions for sweet alternatives: coconut milk ice cream (way tasty and very decadent) and Trader Joe's dark chocoloate covered pretzels. kblog.lunchboxbunch.com has a number of good vegan recipes (and links to other blogs). Good luck! There is a fabulous rice cheese out there that melts and doesn't contain soy. It is called Rice Shreds.